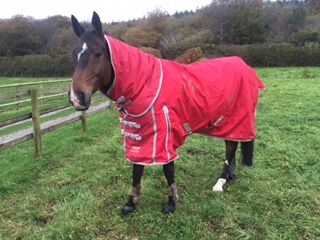 My beautiful boy in his smart new electric fence turnout rug, had his rug back on for the last 2 days as tons of rain here and he’s staying in his paddock …. Yipeeee!!!! People who know me (or in fact pretty much any Cleveland Bay) know that I am a friendly fellow who likes to join other horses in their paddocks from time to time! The only thing that keeps me in the “correct” field is my Guardian Fence Buster rug, I’ve had it for years and it’s still going strong! That said I’ve just heard on the grape vine that Roddis has just put in an order for a spangly new summer weight one in the hope of upcoming sunshine. 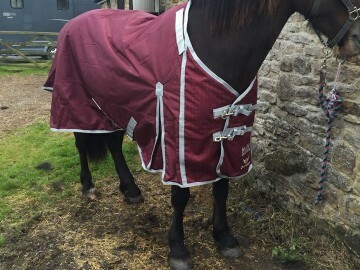 I have been really impressed with the Fence Buster Rug, it looks exactly like normal turnout rug and has options for neck covers and liners as well! 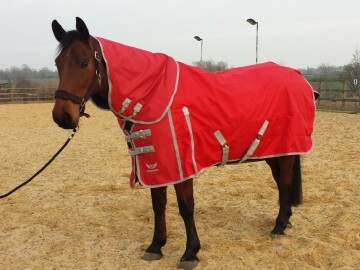 The fabrics that allow the pulse to be transferred to the horse are strong and overall fantastic quality. The most amazing thing to see is the rug in action, it really works!!! Normally my horse would have quite a laissez-faire attitude to electric fencing and has often pushed through it. As soon as I swapped his rug for a Fence Buster he was very much aware of being “zapped” it was very good indeed! The rug doesn’t slip back or pull so it is ideal for 24/7 turnouts. 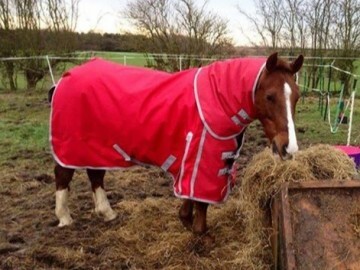 I would definitely recommend this rug to people who have struggled with horses that enjoy breaking out, but also for those out all of the time or young stock that may need to learn to respect electric fencing. I was pinning all my hopes on this and very pleased to report he is still in his field!!! 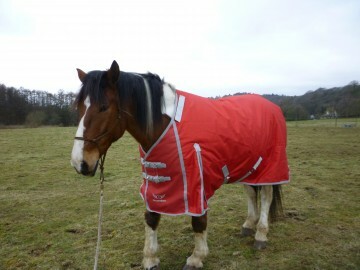 I have an irish cob rocky who believes “the grass is greener on the other side of the fence” and he doesn’t care the fence is electrified, especially when he is rugged up and can’t feel the shock! Rocky lives out 24/7 so with a combination of not so much grass and a normal rug on I would often arrive at the field to find him in other horses fields, or worse still roaming along the public footpath which runs through our yard, thankfully I never found him out on the road! 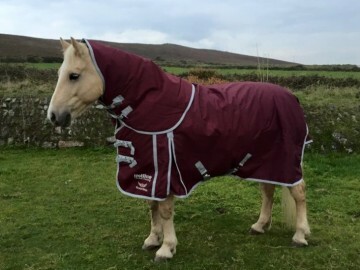 I was getting desperate to try and keep my horse safe and stabling just wasn’t an option so when I saw Guardian rugs advertised in a magazine I was very excited! The fence buster rug was an instant success!! I saw the calculated look on Rocky’s face as he approached the fencing think he had a normal shock protecting rug on, and then i witnessed him leap with a look of total surprise when he tried to duck under the tape in a bid to escape! Now i understand its possibly not nice to see you horse feel the fence, but on this occasion I was very pleased! I would recommend these quality rugs to everyone, and they are an absolute must for those Houdini horses to keep them safe in their fields! 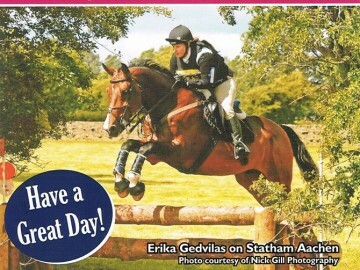 I have competed at BE 90 with my horse Statham Aachen for the past 3 years, having great success winning Stafford this year and Skipton and Bold Heath in 2013. I find the Guardian Fence Buster Rug & neck cover a fantastic fit, very good quality fastenings and materials, lightweight, waterproof and seems to have no pressure points anywhere on my horse; I think this again is down to excellent fit so everything you want from a new zealand rug with the added safety of ensuring the electric shock is felt by Aachen. When in competition you ensure every aspect of safety from cross country boots to the rider wearing an air jacket – so why wouldn’t you want the same when your horse is in the field? And that for me is what Guardian rugs offer. I look forward to seeing/purchasing the lightweight range in the spring, fly rugs and new zealand maks with no fill. 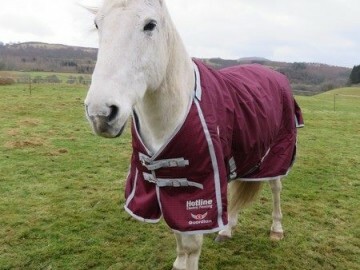 This is my boy James looking rather posh in his new fence buster rug. They are fantastic and will be purchasing more for more other ponies too, good quality and defo worth the money. I haven’t bought one of these rugs however I am a livery owner of a client that has; nothing we did kept him in his paddock, it didn’t matter if he had the best grass, it didn’t matter if he was on his own, bought in first or last or just for a few hours a day – he would break my fencing whenever he felt the need! It’s only been a week, but that’s 7 days of not having to knock posts in or repair broken tape, connectors and pig wire that strengthens the signal, so from a livery owners view these rugs get a big thumbs up!! Update 30.12.15 – It’s been 6 or 7 weeks and touch wood he hasn’t broken the fence once since this rug has been used! !